I wrote before about inserting rows with VBA. 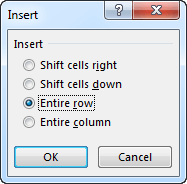 This time, I will show you how you can insert a new row using keyboard shortcuts. There are three methods you can do it. Select a cell and then choose Ctrl + Space to select the entire row. Use Ctrl + Shift + + to insert a new row. A new window will appear. Choose Insert entire row. In the last methods, choose a cell and press the buttons, one after another: Left Alt, I, R.